Way of the Warrior uses personal stories of heroes and soldiers to examine the warrior ethic and to try to answer the question why, during the wars of the 20th century, Native men and women volunteered to serve in the U.S. military in numbers that far exceeded their proportion in the general population. These gripping stories from WWI, WWII, Korea and Vietnam weave a tapestry of positive and negative themes—the warrior ethic, prejudice and stereotypes, forced assimilation, poverty, cultural pride, redemptive acts and healing. The documentary uses historical footage, period photographs, Native music, personal diaries and interviews to reveal what it means to be “ogichidaa,” one who protects and follows the way of the warrior. Return of Navajo Boy (Jeff Speitz, 2000), Hosted by Sandy White Hawk with special guest John Wayne Cly. Return of Navajo Boy chronicles an extraordinary chain of events, beginning with the appearance of a 1950s film reel Navajo Boy, which leads to the return of a long lost brother to his Navajo family. The film uses a series of still photographs and moving images to tell the story of a family living in Monument valley, the impact of uranium mining, and the reunification of an adoptee with his Navajo family. This film is the story of a remarkable woman and storyteller who shared her life and songs with the world. 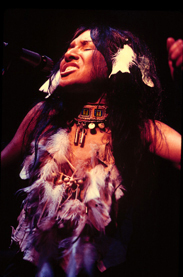 This documentary chronicles her career as she rises to prominence in the 1960s Greenwich Village folk music scene and blazes a groundbreaking path as an Aboriginal activist, digital artist and popular songwriter. This event has been combined with the Native American Voices event held in late April 2008 (see below). The Reawakening tells the story of a successful Native American attorney, Robert Doctor (Michael Greyeyes), who must choose between his affluent lifestyle in New York City, working for a “white shoe” law firm, and his own self-respect. While trying to negotiate a huge casino deal that would put his home reservation at great risk, a childhood friend is accused of murder. Tribal elder Wesley Good Voices (Gordon Tootoosis) asks Robert to defend his friend, forcing him to finally choose between his carefully built world of corporate success and the needs and traditional values of his native people. Pearl, a young runaway, arrives unexpectedly at her aunt’s reservation home. Indolent and bored, Pearl meets Grace, a poor woman, who sells banana bread at the local government offices. Pear gets the idea that she can do this too. What ensues is a life lesson Pearl learns by observing Grace and her inherent goodness — her grace. 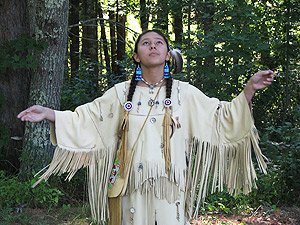 The Tribal Youth Media Camp is held at the community college on the Lac Courte Oreilles (LCO) Indian Reservation (Ojibwe) in northern Wisconsin. The Ojibwe students are part of the tribal community within which the Youth Media Camp is held and camp itself is structured around the identities of the students: that of the Ojibwe tribal member and the science student. Every participant in the camp is part of a video production team whose objective is to produce a science related news story that becomes part of a combined multi- media WLCO Science Report. At the camp, the video production process itself becomes a vehicle for story telling and science skill development. Every story focuses on a culturally significant resource and the experts interviewed in the videos are community- based scientists and respected elders. Sitting Bull: A Stone in My Heart makes extensive use of first-person narration, taken from Sitting Bull’s own words, to present the viewer with an intimate portrait of one of America’s legendary historical figures in all his complexities as a leader of the great Lakota/Dakota Sioux Nation and as a human being. This is a powerful journey into the life and spirit of a legendary figure of whom people have often heard but don’t really know; a true American and a powerful father of this land…one that Americans must all come to know to reconcile their past and their future. 133 Skyway is a visceral reflection of urban homelessness, survival and friendship. Derek Miller plays Hartley, a homeless man trying to get his guitar out of hock. As his health fails, Hartley relies on a troubled friend and the kindness of a lonely pawnshop employee. Director Randy Redroad will be here to talk about his film. Thomas King narrates this spoken word short that offers an insight into how First Nations people today are challenging old ideas and empowering themselves in the greater community.